Vital records of Amesbury, Massachusetts to the end of the year 1849, , at https://archive.org/details/vitalrecordsofam00ames . Topsfield, Mass. : Topsfield Historical Society, (1913) , p. 57. "New York, State Census, 1865," index and images, FamilySearch (https://familysearch.org/pal:/MM9.1.1/QVNJ-JTNQ : accessed 27 February 2015), Porter W Colby, , St Armand, Essex, New York, United States; citing source p. 6, line 24, household ID 37, State Library, Albany; FHL microfilm 866,321. "New York State Census, 1865," database with images, FamilySearch (https://familysearch.org/ark:/61903/1:1:QVNJ-JTNH : accessed 2 April 2016), Lucy Ann Colby in household of Porter W Colby, , St Armand, Essex, New York, United States; citing source p. 6, line 28, household ID 37, State Library, Albany; FHL microfilm 866,321. "United States Census, 1870," database with images, FamilySearch (https://familysearch.org/ark:/61903/1:1:M8NS-TCH : accessed 2 April 2016), Porter Calley, New York, United States; citing p. 8, family 60, NARA microfilm publication M593 (Washington D.C.: National Archives and Records Administration, n.d.); FHL microfilm 552,435. "New Hampshire, Birth Records, Early to 1900," index and images, FamilySearch (https://familysearch.org/pal:/MM9.1.1/FL2T-QLY : accessed 24 Oct 2012), Zebediah A Colby, 04 May 1810. Representative Men and Old Families of Rhode Island, Vol. 3, , at https://books.google.com/books?id=sNo4AQAAMAAJ . Chicago: J.H. Beers & Company, (1908) , p. 1773. Alverdo H. Mason [Transcribed by Dave Swerdferger], Records of the Town of Swansea, 1662 to 1705, , at http://dunhamwilcox.net/ma/swansea_1.htm . (1900) , p. 131. Alverdo H. Mason [Transcribed by Dave Swerdferger], Records of the Town of Swansea, 1662 to 1705, , at http://dunhamwilcox.net/ma/swansea_1.htm . (1900) , p. 187. Alverdo H. Mason [Transcribed by Dave Swerdferger], Records of the Town of Swansea, 1662 to 1705, , at http://dunhamwilcox.net/ma/swansea_1.htm . (1900) , p. 69. Alverdo H. Mason [Transcribed by Dave Swerdferger], Records of the Town of Swansea, 1662 to 1705, , at http://dunhamwilcox.net/ma/swansea_1.htm . (1900) , p. 35, listed as "born 17th of 1689." Alverdo H. Mason [Transcribed by Dave Swerdferger], Records of the Town of Swansea, 1662 to 1705, , at http://dunhamwilcox.net/ma/swansea_1.htm . (1900) , p. 61. Alverdo H. Mason [Transcribed by Dave Swerdferger], Records of the Town of Swansea, 1662 to 1705, , at http://dunhamwilcox.net/ma/swansea_1.htm . (1900) , p. 26. Alverdo H. Mason [Transcribed by Dave Swerdferger], Records of the Town of Swansea, 1662 to 1705, , at http://dunhamwilcox.net/ma/swansea_1.htm . (1900) , p. 52. Albert Gallatin Wheeler, Benjamin Ide Wheeler, E J Wheeler and Francis Rolt-Wheeler, The Genealogical and Encyclopedic History of the Wheeler Family in America, , at https://books.google.com/books?id=hY5bAAAAMAAJ . Boston, Mass. : American College of Genealogy, (1914) , p. 432. Alverdo H. Mason [Transcribed by Dave Swerdferger], Records of the Town of Swansea, 1662 to 1705, , at http://dunhamwilcox.net/ma/swansea_1.htm . (1900) , p. 8. Alverdo H. Mason [Transcribed by Dave Swerdferger], Records of the Town of Swansea, 1662 to 1705, , at http://dunhamwilcox.net/ma/swansea_1.htm . (1900) , p. 46. 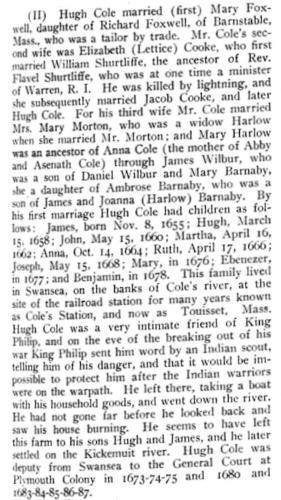 Hugh Cole was born perhaps about 1630. Alvin Lee Rhods, Genealogies of Rhoads-Scott and Related Families, , at https://books.google.com/books?id=86dOAAAAMAAJ . Long Beach, Calif.: (1986) , p. 417. Alvin Lee Rhods, The Royce Family in America, , at https://books.google.com/books?id=e-5OAAAAMAAJ . Madison, AL: (2005) , p. 55. Thomas W. Baldwin, Vital records of Sharon, Massachusetts to the year 1850., Boston: Stanhope press, F. H. Gilson company, (1907) , Vol. 1, p. 82. 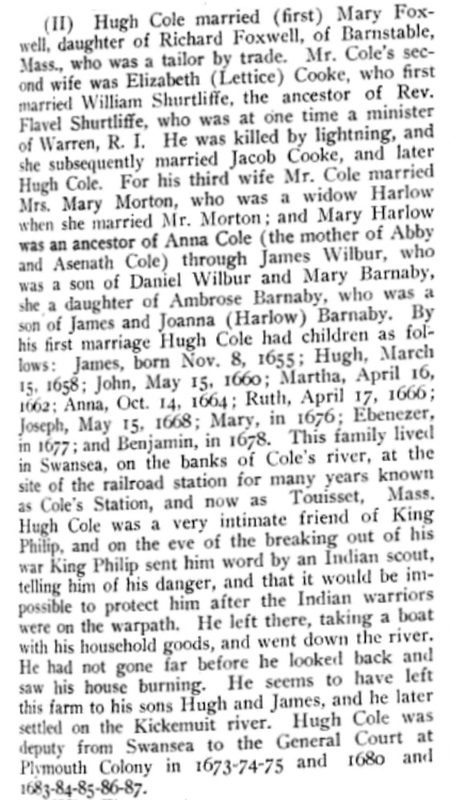 Eleanor Collier of Boston was born perhaps about 1736. Bonnie Collins was born perhaps about 1965. "United States Public Records, 1970-2009," database, FamilySearch (https://familysearch.org/ark:/61903/1:1:2962-JFQ : 23 May 2014), Farley K Collins, Residence, North Salt Lake, Utah, United States; a third party aggregator of publicly available information. "United States Public Records, 1970-2009," database, FamilySearch (https://familysearch.org/ark:/61903/1:1:K5BT-ZBK : 22 May 2014), C Collins, Residence, Salt Lake Cty, Utah, United States; a third party aggregator of publicly available information. Eldora Collins was born in 1834 or 1835 in England. Town and City Clerks of Massachusetts, Massachusetts Vital and Town Records, Provo, UT: Holbrook Research Institute (Jay and Delene Holbrook), , Natick > Births, Marriages and Death > 782. "Massachusetts, Births, 1841-1915," index and images, FamilySearch (https://familysearch.org/pal:/MM9.1.1/FXCK-JZR : accessed 19 Dec 2012), Hiram L Thurston in entry for Waldo F Thurston, 1856. "Massachusetts, Births, 1841-1915," index and images, FamilySearch (https://familysearch.org/pal:/MM9.1.1/FXCR-G2X : accessed 19 Dec 2012), Hiram L. Jr. Thurston, 1858. "Massachusetts, Deaths, 1841-1915," index and images, FamilySearch (https://familysearch.org/pal:/MM9.1.1/N7J6-TSM : accessed 19 Dec 2012), Hiram L. Thurston, 1864. 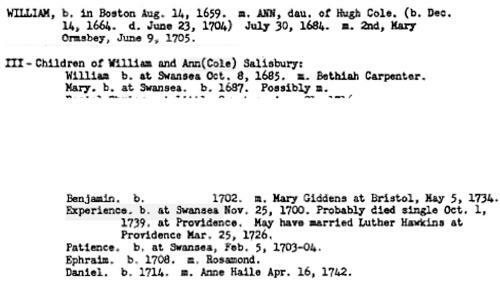 "Massachusetts, Marriages, 1841-1915," index and images, FamilySearch (https://familysearch.org/pal:/MM9.1.1/N436-4ZR : accessed 19 Dec 2012), Hiram Leonard Thurston and Lizzie Louisa Gurgetty, 1880. "Montana, Chouteau County Records,1876-2011," database with images, FamilySearch (https://familysearch.org/ark:/61903/1:1:QJDL-ZDZR : 24 May 2014), Thom Kirkwood Collins in entry for Georgia Elizabeth, 30 May 1920; citing Birth, Carter, Chouteau, Montana, United States, county courthouses, Montana. "United States Census, 1930", database with images, FamilySearch (https://familysearch.org/ark:/61903/1:1:XCMJ-GZ6 : 8 December 2015), Thomas K Collins, 1930.